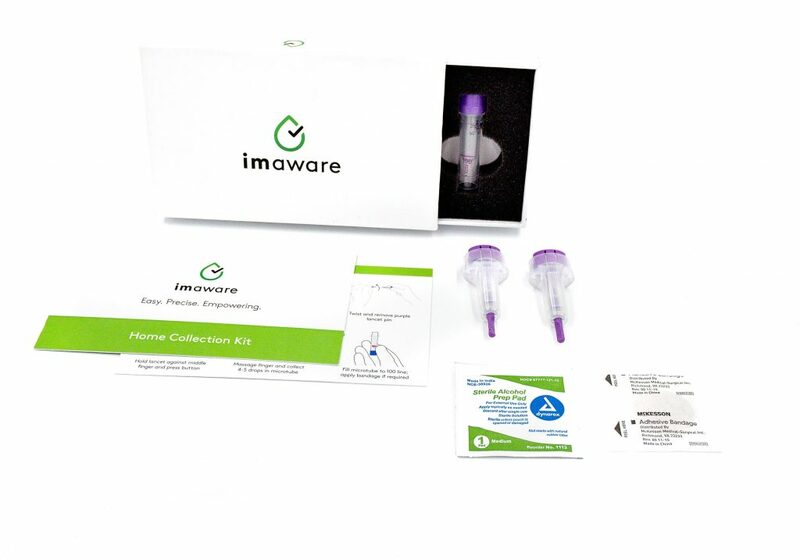 I’m an affiliate for imaware, that manufactures an at-home celiac disease testing platform. I can’t wait to share more about how to use imaware for at-home celiac disease testing. Obviously, my first choice for celiac disease testing is with a celiac-knowledgeable provider. In a perfect world, you’d have a knowledgeable provider like a gastroenterologist for a blood test to check for celiac disease markers, and then move forward with a small intestine biopsy. But we all know that this isn’t a perfect world. Look at my mom. She’s genetically related to me (even thought I painstakingly look like a carbon copy of my father), so she has a higher chance of having celiac disease because I do. But year after year, her provider refuses to test her for celiac disease because she doesn’t display “classic” symptoms. And he doesn’t seem to care that I’m celiac and how that affects her chances of also having the disease or being a carrier. And he doesn’t seem to care that she had a positive genetic test using 23andMe. While it bums me out that he doesn’t seem to care – I have to realize that much of the population is not proactive about their health, and/or they don’t have providers that are proactive about their health. 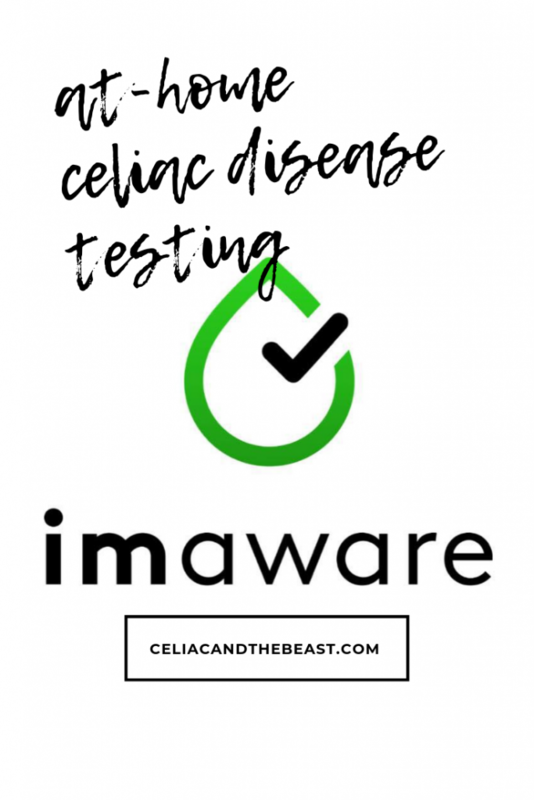 Since I was already tested for celiac disease, I wanted to use my one opportunity as a beta tester for imaware (in partnership with Beyond Celiac) wisely. I had my mom come over and we used the imaware kit to screen her for celiac disease. Because she is a first-degree relative with someone with celiac disease (that’s me), she has up to a 40% risk of developing celiac disease. I made sure that she was eating gluten (as she does normally) and that she was hydrated (even though it’s only a small amount of blood). We used the included products to take a small sample of blood and shipped it off to the lab. The included blood collection process takes a small amount of capillary blood that can be completed in about 5 minutes. At the lab, they use their technology to screen your blood sample for celiac disease biomarkers. All results are reviewed by an in-house physician, and the reports are then uploaded online. Below is an actual report based on a serological sample sent to imaware. Based on tTG IgA (what celiac.org describes as the best way to test for celiac disease), tTG IgG, DGP IgA and DGP IgG (tests to double check with false positives and false negatives) – all levels were normal. It also takes into consideration that she has a first degree relative with celiac, and she’s also been eating gluten (a lot of it – because she really likes bread, but I didn’t tell imaware that). She also does not have pre-existing conditions (Down Syndrome, Turner Syndrome, T1D, Hashimotos or psoriasis) based on information that we sent along with the blood screener. Based on all of this, she was given an 18% chance of developing celiac disease. That falls under the “less likely” category for those between 2%-25% likelihood of developing celiac. There is also “detailed results” available for physicians to see the exact blood test results for each biomarker. Remember, serology testing – testing for celiac disease using blood – is only a screening. To be diagnosed with celiac disease, you must have a small bowel biopsy. For $99, this type of peace of mind is what I needed. I can’t imagine I’m the only one with a parent, brother, sister, aunt, uncle, cousin (etc.) that has a doctor that is flippant about celiac disease testing. While I would love to scream from the mountain top about screening first and second degree family members for celiac – it would just go unheard. Celiac is a blip on most physician’s radar. Even with gastroenterologists, everyone has a specialty. How many of us were diagnosed with IBS first instead of celiac disease? I am not blaming doctors – the medical system here in America is flawed at best. I know that doctors have us – the patient – first and foremost in their thoughts. But everyone is busy, and celiac was once thought of as a rare disease, not the 1:100 that we’re seeing today. Sadly, not every doctor is screener happy when it comes to celiac. And for those patients with doctors like that – I’m happy imaware exists. imaware strives to provide results back within 5 days to help speed up your path to diagnosis. As recommended, you would take this test to your provider and ask for additional testing, like the biopsy, that should be covered under your insurance. Based on that biopsy, along with results from this blood screen, and any genetic screening, your provider can diagnose you with (or exclude you from) celiac disease. Available online at imaware.health for $99.00 (affiliate link), imaware™ is a convenient and reliable at-home blood testing solution. Easy-to-use collection kits and accurate online results empower you to take control of your health. Currently, imaware offers celiac disease at-home testing, as well as celiac disease at-home monitoring. imaware currently offers a rheumatoid arthritis screening test as well. In the future, they are set to release a heart disease test and a prostate cancer screening test. I am an affiliate for imaware health, and was a beta tester for their celiac disease test before available on the market. I had no idea this was a thing. I’m going to suggest it to my parents and siblings for sure! This is fabulous! We’re all about taking control of our own testing, and love that more products like this are becoming available. It’s nice that you can do it on your own time too. Does this tell you if you have celiac or just that your predisposed to celiac? Do you have to be eating gluten for it to be correct and how long do you have to be eating it for before taking the test? It’s an at-home serology test – which is a SCREENER for celiac disease that brings you to your next step, a biopsy. And yes, you have to be eating gluten. Hmm, the at home monitoring would be nice for me. Since it took me several months to realize lexapro was glutening me.